Have been promising to make one of these for ages - sorry, same problem with orientation as the last one. Think her arms need to be a bit shorter, so will do that next time. Apart from the paper I used for her dress and to cover her wings, everything else is recycled (and washed, of course) and based on three ice-cream sticks and two coffee stirrers. Longer coffee stirrer cut in half for the legs, slightly shorter stirrer cut in half for the arms. Legs and arms glued onto a small ice-cream stick as a body, with an identical stick glued over the top. Piece of paper wrapped round in a cone for the dress: collar made of two small strips of paper put over shoulders, as the dress has to be wrapped under the arms. Paper glued to the printed side of a Magnum stick and glued on as wings. Face drawn on. Hair made of thin offcuts of cream paper, curled round a knitting needle and glued on to cover the gap between the two ice-cream sticks which make the body. That's a bit of fun, and good excuse to enjoy some lollies too! I wouldn't worry about the length of the arms, don't all northern angels have long arms? thriftycrafter wrote: I wouldn't worry about the length of the arms, don't all northern angels have long arms? 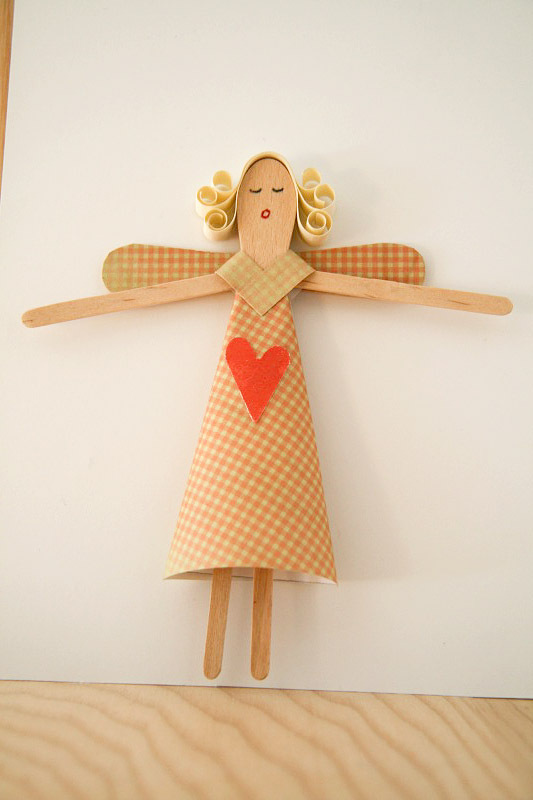 thriftycrafter wrote: don't all northern angels have long arms? All the more to get round you for a big hug. I think this is just lovely Lynda. Really cute. I think she is beautiful as she is Lynda.